Apogee Duet sets the industry standard for portable professional audio recording on Mac and iPad. Made for the musician, producer and engineer that wants the ultimate sound quality and elegant simplicity, Duet features legendary Apogee AD/DA conversion, two world-class microphone preamps, USB MIDI I/O and ESS Sabre32 DAC technology. 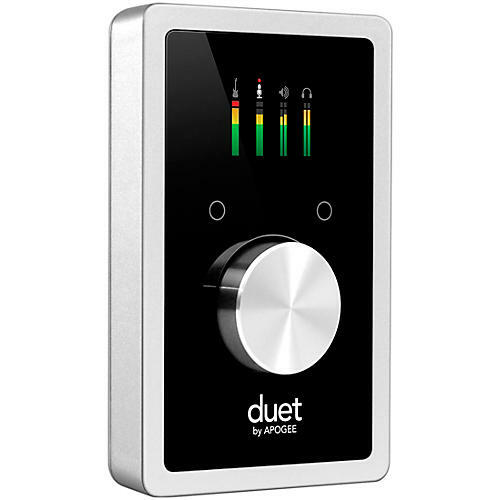 With Duet’s two combo inputs you can connect microphones, guitars, keyboards or line level devices such as external mic preamps or a mixing board. Duet also includes four analog outputs – two 1/4” balanced outputs for connection to speakers or outboard equipment and a separate, independently controlled 1/4” stereo headphone output. An Apogee technology first introduced in 1992 on Apogee’s AD-500 converter, Soft Limit can be heard on countless platinum selling records around the world. Once a technology exclusively reserved for Apogee’s most advanced audio converters, Soft Limit is included in Duet and can be enabled in Apogee Maestro software. This superior analog design prevents the digital clipping that causes distortion by instantaneously rounding off transient peaks before they hit the analog-to-digital converter. Soft Limit allows several more decibels of apparent level to be recorded while subtly providing an analog-like warmth to the sound. The high-resolution OLED screen built into Duet’s top is the main control center for Duet, delivering visual feedback for multiple functions including metering, numeric value for input and output levels, input grouping, and phase, muting, phantom power and Soft Limit indication. With this display, you know the status of any input and output at any given moment without having to refer to Maestro or your recording software. APOGEE ELECTRONICS CORPORATION warrants this product to be free of defects in material and manufacture under normal use for a period of 12 months. The term of this warranty begins on the date of sale to the purchaser. Units returned for warranty repair to Apogee or an authorized Apogee warranty repair facility will be repaired or replaced at the manufacturer's option, free of charge. All units returned to Apogee or an authorized Apogee repair facility must be prepaid, insured and properly packaged. Apogee reserves the right to change or improve design at any time without prior notice. Design changes are not implemented retrospectively, and the incorporation of design changes into future units does not imply the availability of an upgrade to existing units. This warranty is void if Apogee determines, in its sole business judgment, the defect to be the result of abuse, neglect, alteration or attempted repair by unauthorized personnel. The warranties set forth above are in lieu of all other warranties, expressed or implied, and Apogee specifically disclaims any and all implied warranty of merchantability or of fitness for a particular purpose. The buyer acknowledges and agrees that in no event shall the company be held liable for any special, indirect, incidental or consequential damages, or for injury, loss or damage sustained by any person or property, that may result from this product failing to operate correctly at any time. Limited Warranty. Apogee Electronics warrants for a period of ninety (90) days from your date of purchase that (i) the media on which the Software is recorded will be free from defects in materials and workmanship under normal use, and (ii) the Software as provided by Apogee Electronics will substantially conform to Apogee's published specifications for the Software. Apogee Electronics' entire liability and your sole and exclusive remedy for any breach of the foregoing limited warranty will be, at Apogee Electronics' option, replacement of the media, refund of the purchase price or repair or replacement of the Software.